Rittal Cooling Systems: "Built Ford Tough" to outlast! | Rittal - The System. Ford Motors has been working with Linear Systems and Rittal globally for years. When Ford’s Cologne engine plant shut down a number of times in one year due to defective cooling units, Ford accepted Rittal’s offer to carry out a manufacturer-independent inventory of all the cooling units and to identify potential energy savings. The analysis revealed the urgent need to repair and replace 11% of the cooling units. Rittal’s comprehensive energy efficiency calculation resulted in savings of over CAD 860,000 within 10 years, with a payback period of just 2.4 years for the investment in the new cooling units. Helmar Bencker, Plant Engineering & Environment Manager at Ford in Cologne. 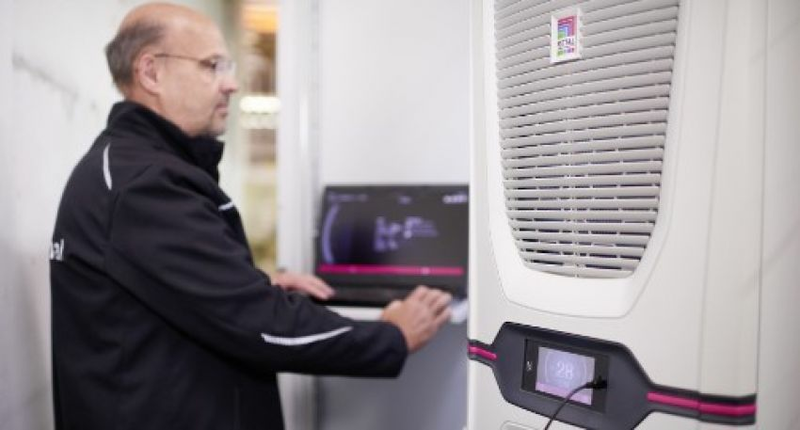 The Rittal technicians checked the maintenance status of more than 220 cooling units at the Cologne Ford factory, relating to both Rittal climate control units, as well as third-party equipment. They checked the cooling unit components for dirt accumulation, damage and bearing noise. Then they drew up a maintenance checklist and made a number of improvement suggestions. Analysis showed that of the 220 enclosure cooling units installed, 25 were defective and needed to be repaired or replaced. The majority of these systems were competitor products with an average age of just five years. Parallel to the service check, the Rittal team set up a practice-oriented test facility at the engine plant. From July 2016 onwards, the 2.6-kilowatt Rittal Blue e+ cooling unit was compared with a 2.5-kilowatt cooling unit from a competitor. Initial findings show that the Blue e+ unit offers energy savings of 88.9% compared to the third-party system. Based on the data collected, Rittal compiled a comprehensive efficiency calculation for the Ford plant in Cologne. Replacing 150 cooling units by Rittal “Blue e” and “Blue e+” systems would make it possible to achieve savings of more than CAD 860,000 and 276.3 tons of CO2 over a useful life of ten years. Deducting the investment sum would result in a brief payback period of just 2.42 years, clearly less than the 3.5 years required. Its efficient products and consulting service have helped Rittal to get closer to being included in the technical delivery specification again with its cooling units. This represents a major endorsement for the Rittal service team and their new consulting services. For more Rittal references, please visit our YouTube channel or click here . For the latest Rittal Resources, click here . Contact Marketing@rittal.ca for more info.